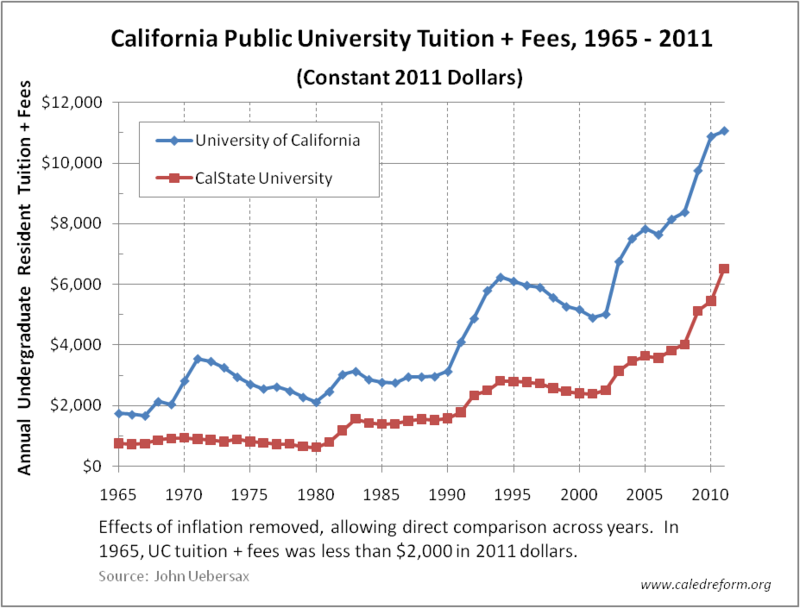 The chart below shows even more clearly how unfair the current tuition and fees for California public universities are. It removes the effects of inflation by expressing tuition + fees each year in 2011 dollar equivalents. This permits direct comparisons across time. Thus, for example, in 1965, a typical UC resident undergraduate student paid the equivalent of $2000 in today’s dollars. Now the same student would pay more than $11,000. Because inflation effects are removed in the chart, the dramatic increase over time reflects only misplaced priorities, greed, irresponsibility, and the callous willingness to place students in debt. Students and their families should not accept this. To begin, they should demand an immediate moratorium on all tuition and fee increases. An earlier post demonstrated how badly students at the University of California are being taken advantage of with exorbitant tuition and fees. The results there showed that, even after adjusting for inflation, UC students today pay more than four times as much in tuition and fees as their parents’ did. Here we examine the second tier of California’s public higher education system, the California State Universities (CSU), and find that the situation is even worse. See the figure below. The red line shows the actual average undergraduate (resident) tuition + fees across CSU campuses, from 1975/76 to 2011/12. 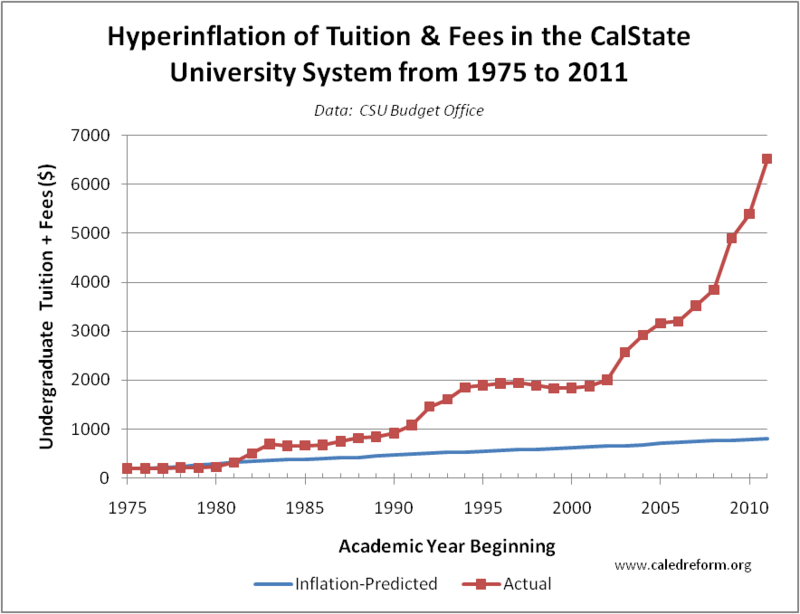 The blue line shows what tuition + fees would be if they increased only because of inflation. These numbers are calculated based on historical Consumer Price Index data (specifically, the CPI-U, which applies to urban consumers). 1975 is used as the base year. The ratio of the height of the two lines gives the rip-off index — or how much tuition and fees have hyperinflated relative to general cost of living — for a given year. For 2011/12, the ripoff index is obtained by dividing actual tuition + fees ($6,519) by what would be expected by inflation alone ($810), giving 8.04. Interpretation: after adjusting for inflation, the financial burden on students and their families to pay tuition and fees at CSU today is 8 times greater than in 1975! Moreover, by this standard, CSU students are being ripped off twice as badly as UC students. In addition we should note that, unlike their parents, students today may find that their degree has no value in securing a good job. Some might reply that $6,519 per year isn’t terriby expensive. To that the response is two-fold. First, this means that the four-year bill for a CSU diploma is presently over $26,000, which is a hefty amount. Second, the fact is that, a generation ago, the people of California chose to create a second university system that placed virtually no financial burden on students. Little by little the commitment to suppy a higher education to every eligible and motivated student eroded. We need to reassert and live up to the original vision of the California Master Plan for Higher Education: that some form of higher education ought to be available to all regardless of their economic means, and that academic progress should be limited only by individual proficiency. A spreadsheet (.xls) with all data and calculations is available on request. College Tuition: Inflation or Hyperinflation?